One of the ice cravings you can see on our Sapporo Snow Festival tours from Hawaii. On Sapporo Snow Festival tours in Japan you’ll see spectacular ice sculpture displays. You’ll find them in Hokkaido’s capital, Sapporo, each February. High school students first started the Snow Festival in 1950 when they built a few snow statues in Odori Park. But now it’s a large, popular event, featuring spectacular snow and ice sculptures. It attracts more than two million visitors annually from Japan and across the world. Visitors can find the event in three places: the Odori Site, Susukino Site and Tsu Dome Site. The main site is the Odori Site in Sapporo’s Odori Park. Here, you can view the festival’s famous large snow sculptures. Some measure more than 25 meters wide and 15 meters high. Festival organizers will keep the exhibit lights on until 10:00 pm. Besides about a dozen large snow sculptures, the Odori Site exhibits more than one hundred smaller snow statues. Plus, it hosts several concerts and events, many of which use the sculptures as their stage. The Sapporo TV Tower provides a good view over Odori Park, which stands at the eastern end of the park. People can enter the from 9:00 am on weekdays and from 8:30 am on weekends to 10:30 pm during the festival. You can buy either a day or a night ticket for 1,000 yen. While admission to the top observatory deck costs 700 yen per adult. The Susukino Site, exhibits about one hundred ice sculptures. You can find this site one subway stop south of Odori Park. The ice sculptures here are lit up daily until 11:00 pm and until 10:00 pm on the festival’s last day. You can find three types of snow slides and snow rafting at the Tsu Dome Site. It is a family oriented site featuring more snow sculptures. Inside the dome, there are many food stands and a stage for events. The Tsu Dome Site is open daily from 9:00 to 5:00 pm. Panda Travel ® has been bringing its customers from Hawaii for some time now and our tours always offer a memorable time to those that attend. Come join us to see Japan’s most talented sculptors put their work on display by checking out our Japan Tour Packages online. Here is a sample of what our customers think about our Sapporo Snow Festival tours from Hawaii. John, thank you very much for taking great care of us and for a wonderful first-time trip to Japan (for Jeannie). Aloha. – Jeannie and Walter. 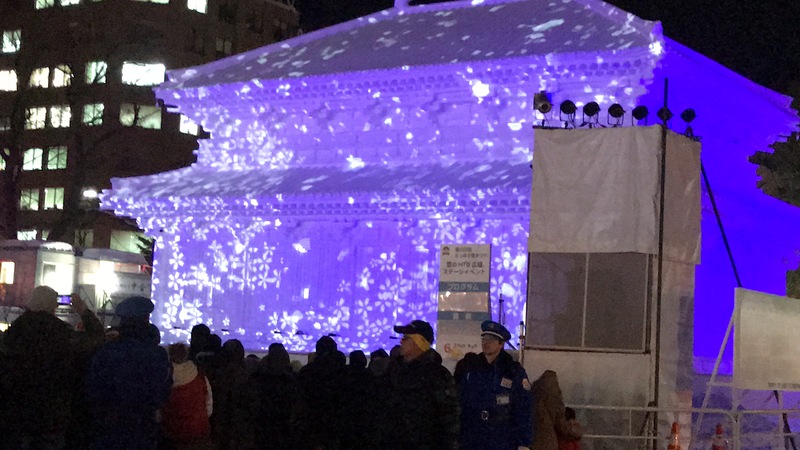 Thank you for an enjoyable, very interesting and exciting 65th Sapporo Snow Festival Tour! The weather was perfect, a little wind and lots and lots of ice and snow. Seeing snow falling was the first for both of us. It was very beautiful! The ice sculptures at Lake Shikotsu, Susukino and Odori Park are unbelievable. The food was delicious so we tried different dishes that only Japan has. Our room at the hotels was very comfortable, but best of all, we had 2 tour escorts that made sure we were okay. Thank you again for making our trip a memorable one. Take care and hope to go on a tour with Panda Travel again. Two weeks ago was my very first time going to Japan which was an amazing tour with our very own Panda Travel ® tour package, Sapporo Snow Festival Tour #2. It was an excellent tour and an unforgettable trip that I will cherish for a lifetime. Everyone on the tour told me they had an awesome time and that the price we paid for the tour was so worth it. As for myself I believe I was a great help on this tour as a paid customer but also as a Panda Travel employee by making sure everyone was checked in at the Honolulu Airport. I made sure one of our customer that was traveling alone was safe and did not forget any of his valuables behind. One day I even took off my beanie and ear muffs and put it on him to use because it was cold and snowing which he did not have no covering for his head to keep him warm or from getting sick. But mainly making sure everyone had a wonderful time during the whole trip! This has been a dream come true for me to go to this spectacular Sapporo Snow Festival with my very own employer, Panda Travel.